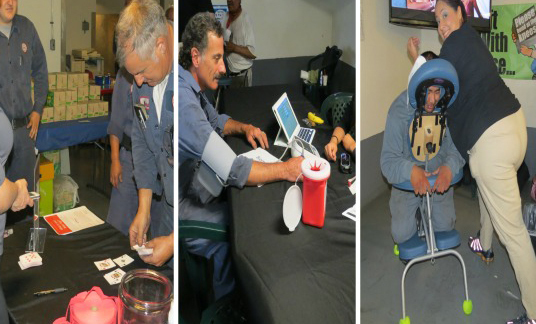 AB&I Holds Fifth Annual Wellness Fair and Offers Free Flu Shots to Team Members | McWane, Inc.
AB&I held their Fifth Annual Wellness Fair for team members on September 25. The goal of this year’s Wellness Fair was to raise awareness through education the importance of keeping fit and eating healthy as well as the critical importance of preventative care. To accomplish this, AB&I partnered with Blue Cross & Blue Shield of Alabama to offer onsite biometric screening. Team members took advantage of the opportunity to participate in the voluntary confidential biometric screening that was provided to them at no cost on-site. The screenings included measurements of blood pressure, total cholesterol, HDL, LDL, triglycerides and glucose. Team members were furnished the results right away so they could begin making any necessary changes to improve their results. AB&I’s insurance broker, Filice, provided a healthy lunch, massages, and a fun way to find out your brain age through a card game. AB&I’s Mickie Nguyen finished the game in 28 seconds making her the youngest team member in “brain age” under 20 years old. AB&I Team Member – Isaac Beltran, Jr.
As part of the preventative care program, AB&I provided on-site flu shots to all team members free of cost and through U.S. Health Works on October 2. This program followed the recent Wellness Fair at AB&I. Posted on October 15, 2014, in Get Healthy With McWane and tagged AB&I, biometric screening, Blue Cross & Blue Shield of Alabama, fitness, flu shots, Health, McWane, preventative care, wellness fair. Bookmark the permalink. Comments Off on AB&I Holds Fifth Annual Wellness Fair and Offers Free Flu Shots to Team Members.